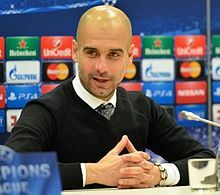 Josep "Pep" Guardiola Sala (Catalan pronunciation: [ʒuˈzɛb ɡwəɾðiˈɔɫə]; born 18 Januar 1971) is a Spaingie umwhile fitbawer who is the current manager o Premier League club Manchester City F.C.. He wis previously manager o FC Barcelona an FC Bayern Munich. ↑ Pla Diaz, Emilio (1 December 2002). "Josep Guardiola Sala - International Matches". Rec.Sport.Soccer Statistics Foundation. Retrieved 16 January 2013. ↑ "Pep Guardiola". fcbayern.de. Retrieved 16 May 2014.